The first of February was an exciting day for Shreya Shettigar and for all of us in the MBIS community. 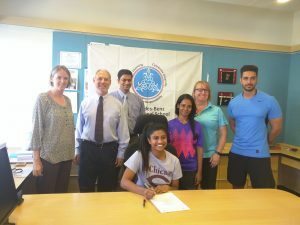 This was the University of Chicago, NCAA Division III Women’s Soccer signing day for Shreya. 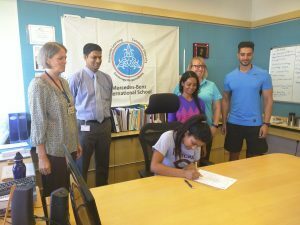 She has been accepted to this highly competitive soccer team in a highly competitive university along with only four other students entering the undergraduate class of 2021. As given by the NCAA, “The Division III experience provides for passionate participation in a competitive athletics environment, in which student-athletes push themselves to excellence and build upon their academic success with new challenges and life skills.” Division III students first meet the academic admissions requirements of the university before athletics selection. According to their own information, the University of Chicago sets a very high bar for admissions using a holistic approach as demonstrated through Character/Personal Qualities, Curriculum, Secondary School Grades, Essay writing, Recommendations, Talent, Extracurricular (CAS) Experiences and Test Scores (ACT/SAT/IB). These led to an admissions rate of just 7.6% for the university in 2016. In addition to clearly meeting all of the admissions requirements through her exemplary application, Shreya was also selected by the coach at the University of Chicago for her demonstrated skill at summer soccer camps in the US. While Shreya was given a number of offers from highly competitive schools for her soccer talents, she has chosen the University of Chicago with its academic culture as the best match for her. At MBIS we strongly encourage a “best fit” approach to university applications and in Shreya’s case the University of Chicago is clearly an excellent fit for her. While there are many flaws in the ranking systems for colleges and universities, it is interesting to note that the University of Chicago was ranked by the US News and World Report as #3 in National Universities for 2017. This puts it in a tie with Yale, just below Princeton and Harvard, and above Columbia, Stanford and MIT. The Times Higher Education rankings lists the University of Chicago as #10 in the World University Rankings. Congratulations once again to Shreya!